My two pugs are very vocal but in different ways. Sunny's a loud yawner (the sound she makes is out of control and always makes me laugh!) and likes to howl when excited. Rosy is a growler and barker (too many dogs in tv commercials!). Both are noisy snorers (Rosy is super loud!) and frequent tooters. All of their sounds make me smile or laugh, unless it's super late or early and I'm trying to sleep! What are some of your favorite and least favorite sounds your dog makes? Our pugs chortle. There's no other way to explain that little high-pitch growly sound they make. We call it the puggie-chortle, it's their happy and content sound. Love the blog and the pics. Sunny and Rosie are precious. My pugs make a high pitch, squeely noise when they are ready to come inside and I have forgotten to open the doggie door. 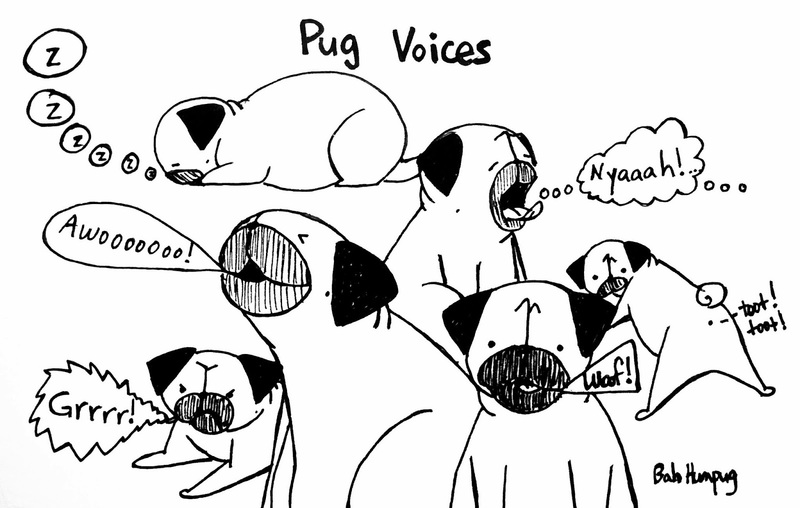 I have 12 and a half pugs so it makes for a loud chorus of pug yelling. The half is a Boston Pug, 1/2 Pug 1/2 Boston Terrier. My Pierre is only 6 months old and still suckles in his sleep... it's the most precious thing ever. My pug Roger snores really loud but at times I catch him suckling in his sleep. And I loooooove that howl/bark that I could never tell him to be quiet because it is too cute.